exposure! Keep up the superb works guys I’ve incorporated you guys to blogroll. known, it is growing in popularity, mainly as a result of four important advantages: speed, safety, efficiency, and cost-effectiveness. Fine way of describing, and nice paragraph to get information on the topic of my presentation subject, which i am going to convey in college. The Bank of Japan caused the hsinuog bubble—but they were attempting, without success, to stop their own domestic HousingPanic. Greenspan was an accomplice in the crime instead of a watchdog.The problem isn’t just rates, but non-interest rate underwriting regulation and reserves.The Fed and OHFEO have plenty of regulatory authority over that, and they did absolutely nothing, just how Alan refused to raise margin requirements in the 1999 stock dot com bubble.He easily could have. Imagine—suppose in 1999 that Alan had done so. After the 1998 Asian stuff, the economy was doing fine, and equities were in an obvious bubble. Fall 1999, Greenspan raises minimum margin requirements by 10%, promising more hikes if needed. Brokers respond by reducing margin even more to the dot-bombs. Nasdaq gyrates, and eventually peaks at 4000 (not 5000) in March 2000.Internet stocks and employment go through a retrenchment, but not a nuclear winter.NASDAQ is 3700 on Election day 2000. Al Gore squeaks out an electoral vote victory with a significant popular vote win. 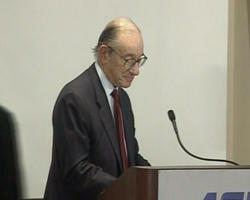 Alan Greenspan quits. Bill Clinton gives him a pre-emptive pardon and Presidential Medal of Freedom.2001: Economy shows a modest cyclical slowdown centered around in technology, and new Fed Chairman Ben Bernanke reduces rates from 6% to an “accomodative” 3%. Summer 2001: Intelligence chatter picks up in mideast. “Bin Laden determined to strike USA.” National Security Adviser Wesley Clark brings together heads of departments, orders improvements in customs and FBI tracking of foreign nationals. FBI questions and deports three Saudi pilot students. FAA alerted, gives pilot’s advisory with reference to thwarted al-Qaeda “Bojinka” suicide plot. Crews ordered to resist middle eastern hijackers in groups and lock cockpit doors. Sept 11,2001. Breathless media report two attempted hijackings of American jets. In one, hijackers kill two flight attendants but crew diverts to military base. SWAT and Delta Force surround aircraft. After 24 hours bomb threat is deemed unreliable, hijackers and two passengers killed during raid. In second, hijackers storm the cockpit during landing approach, plane crashes just short of runway in struggle, 87 killed. Surviving, wounded hijacker implicates Khalid Sheik Mohammed.